Get an early start on graduate school! 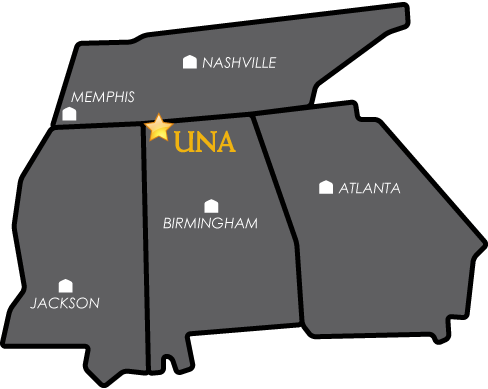 The new Accelerated Master’s Program (AMP) offers qualified UNA undergraduate students the opportunity to enroll in graduate coursework that can be applied concurrently to an undergraduate and graduate degree. Undergraduate students can take up to 9 graduate credit hours* at undergraduate tuition rate. This is a cost savings by reducing the cost of your master's degree! *Graduate credit hours vary by department. Join academic communities with peers and faculty mentors who can facilitate your success. In addition, this provides a chance to participate in professional development and academic conferences. You will be on a fast track to equip yourself with a graduate degree to better prepare you for the job market. Earn your degree by completing coursework at a faster pace in your accelerated program. Students must earn a B or higher in graduate-level coursework to earn graduate credit and continue in the AMP. Grades of a C or lower will still count towards the undergraduate psychology degree requirements. Admission to the AMP program does not automatically guarantee admission to graduate school. Students must formally apply to graduate school. Apply for graduate admission during semester prior to formally starting the graduate program by creating a MyUNA Profile. The graduate application fee is waived for AMP students. Students must maintain cumulative grade point average of 3.0/4.0 or higher. Individual graduate programs may have higher standards. Students may complete the Master's degree within 12 months from the completion of the Bachelor's degree for a non-thesis Master's degree and within 18 months for Master's Programs requiring a thesis.